When I think of the cuisine in New Orleans, po’boys, jambalaya, and gumbo pop into my mind. 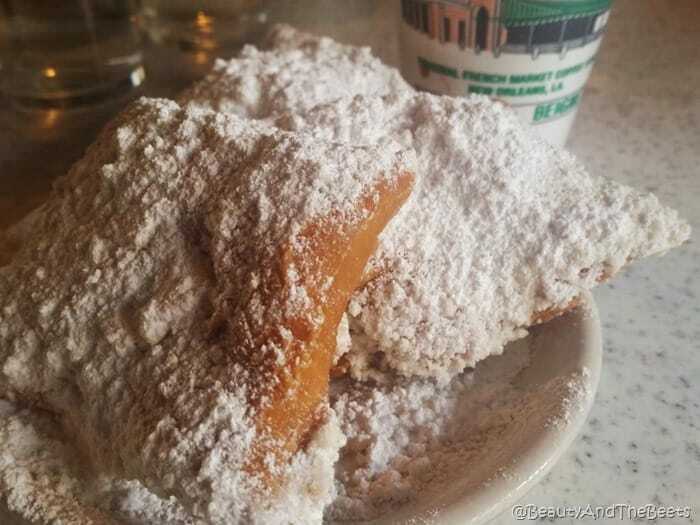 NOLA has more signature dishes than most American cities, but arguably the most popular food to come out of New Orleans is beignets. While the beignet itself can be dated as far back as the 16th Century in France, fried dough has been around since ancient Rome. 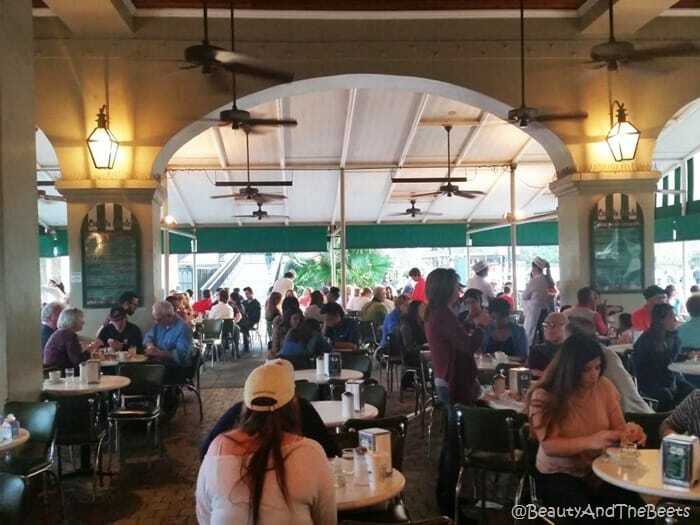 New Orleans brings the beignet to a whole new level – especially if you take a trip to the famed Cafe du Monde. 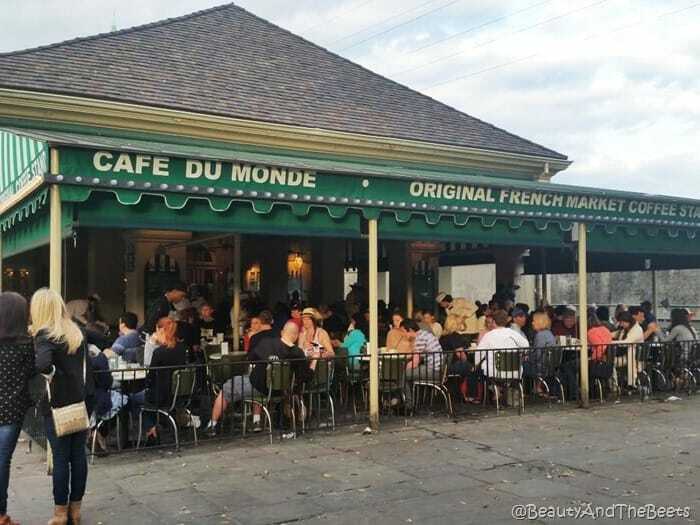 Since 1862, Cafe du Monde has been serving up fried, raised pieces of yeast dough and chicory coffee in the French Quarter neighborhood of New Orleans. 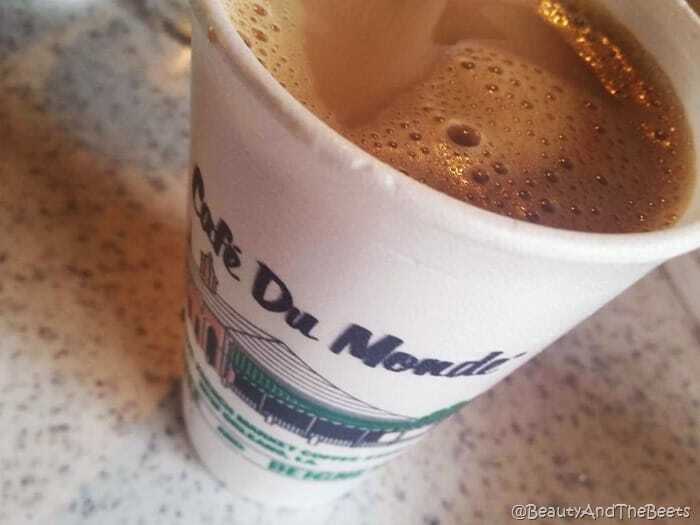 Cafe du Monde is open 24 hours a day, 7 days a week. The only day the cafe is closed is Christmas Day, and according to their website, they also close for the occasional hurricane that may skirt the city. You can expect a long line during peak hours, usually anytime the sun is up. However, we arrived at 8am and were able to grab a table immediately, but by 9am the line was wrapped around the block. The menu is very simple. Beignets are served in threes and are the only food offered. Your beverage choices are coffee, soda, water, hot chocolate, or orange juice. And even more simple – the coffee is served black or with a little steamed milk (though you can get it iced or frozen). It seriously limits the amount of time one spends agonizing over the menu. After all, there is a line out the door, so it would be considerate of you to order quick. However, you are not rushed. So don’t feel like you have to necessarily eat quickly (though those in line may give the stink eye to those who linger over coffee at their tables). The coffee is strong – a blend of dark roast and chicory. Chicory is a flowering plant and it is the root that is used in coffee, a signature ingredient found in New Orleans. The service is real quick, beignets are on the table within 5 minutes of placing an order. It’s not like they are cooked to order – they are just so popular that the kitchen is constantly churning them out. The turnover is real quick. And it is worth every minute you have to wait in line. 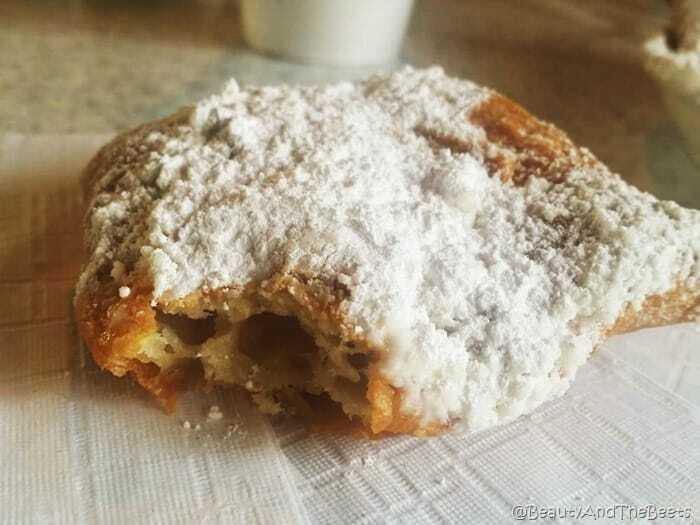 The beignets are so light and airy, and the powdered sugar just uplifts the experience. The beignets are so hot and fresh that the sugar melts into the dough. Anywhere you walk within the French Quarter you can see where one has enjoyed a beignet by the crumbs of powdered sugar left on the streets, the sidewalks, and the park benches. 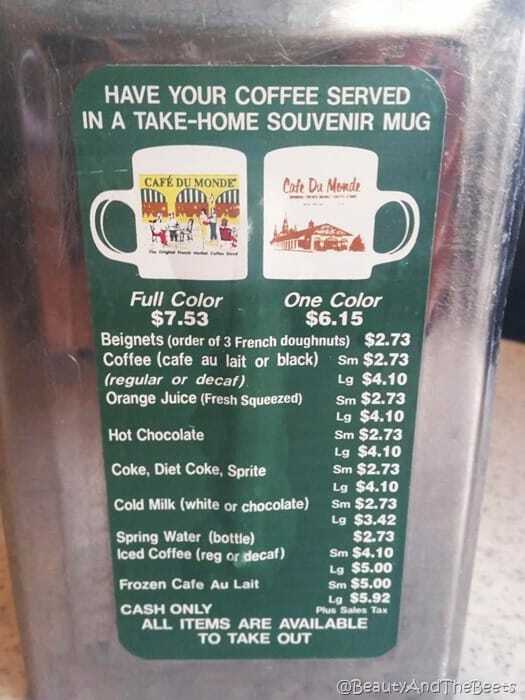 One last thing to keep in mind when you visit, Cafe du Monde only accepts cash. There are now 9 locations in the New Orleans area, but to really make it a signature New Orleans experience, you have to eat at the original location in the French Quarter. 5 out of 5 sprouts. We have been to Cafe du Monde and loved it. 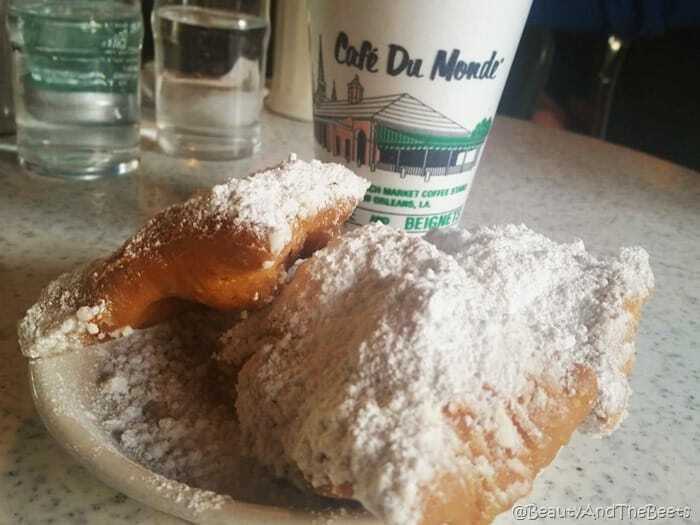 It is definitely a must-go destination when in NOLA.